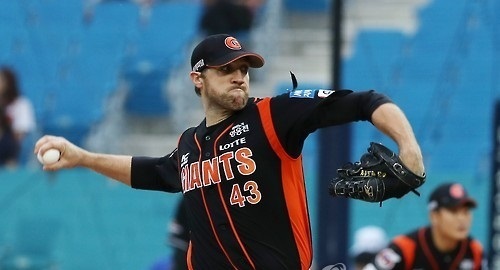 The South Korean baseball club Lotte Giants on Thursday reacquired their former ace Josh Lindblom. The 30-year-old American right-hander is rejoining the Korea Baseball Organization team that he left seven months ago, so that he could be back home with his ailing daughter, Monroe. Lindblom signed with the Pittsburgh Pirates and made four appearances there, posting a 7.84 ERA in 10 1/3 innings without a win-loss record. The Giants said Lindblom agreed to a $475,000 deal for the rest of the season. He's replacing American left-hander Nick Additon, who was waived by the Giants on Wednesday after going 2-7 with a 5.91 ERA in 15 appearances. Lindblom pitched for the Giants in 2015 and 2016. He was 13-11 with a 3.56 ERA in 32 appearances in 2015, and quickly became a fan favorite in Busan with his performance on the mound and charitable efforts off the field. In 2016, Lindblom went 10-13 and had a 5.28 ERA in 30 starts. Last winter, though, Lindblom chose to return to the United States to spend more time with Monroe, who was diagnosed with a heart defect before birth and underwent her first open heart surgery in the US Lindblom said at the time his initial plan was to return to Lotte for a third season, but he couldn't turn down an opportunity that would allow his family to stay together. Monroe's condition will require multiple open heart surgeries, according to a US article in June. Children born with her condition live into their 30s and 40s, the report said.